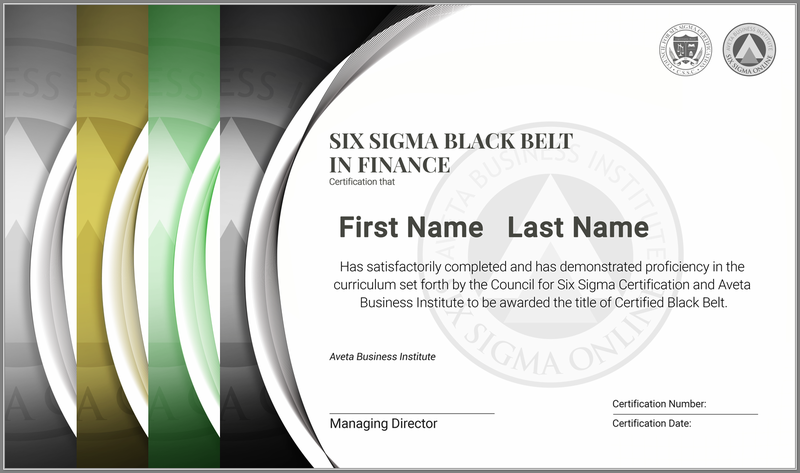 What is Six Sigma Black Belt Certification in Finance? Six Sigma Black Belt Training and Certification in Finance will positively impact your career by providing a deep understanding of not only the methodology, but the leadership role within Six Sigma. A Six Sigma Online Black Belt Certification in Finance will demonstrate your ability to be a leader in the execution of Six Sigma projects. Six Sigma is a methodology that utilizes statistical tools and concepts to identify variations or defects in a process. An Accredited Six Sigma Certification in Finance indicates an individual has achieved a particular level of knowledge in the study and application of this methodology. This type of certification will make you a more valuable asset in any industry and enhance your career greatly. Across the board, it is an extremely worthwhile investment for any financial institution to implement the Six Sigma methodology into their business procedures. This type of training is essential to a complete overhaul of the previous system, bringing further success to the company. In addition, a primary focus in finance is the reduction of waste. Within the industry, this is often found in a decrease of errors and defects within normal processes making them more efficient over time. Training allows individuals and teams to eliminate unnecessary steps and costs in order to be successful in reducing waste. Additionally, it also teaches individuals how to better use company resources which helps them to finish tasks more quickly. This, in turn, leads to lower production costs while still maintaining a high standard of business. Essentially, this program pinpoints excessive expenditure in order to bring about a cost-effective business budget plan. Financial institutions constantly need to increase and improve compliance in order to provide efficient services throughout all departments and areas of business. This helps the industry better their workers by improving their knowledge and competency. This process also encourages individuals to be more creative or think outside of the box. These innovative and creative ideas are able to be implemented into the business to help improve sales, reduce costs, increase performance, and improve customer support and satisfaction. Our Six Sigma in Finance programs are the same exceptional courses you will find in our standard Six Sigma programs while featuring customized videos that have been specially developed for the Finance industry. Six Sigma within the finance industry helps reduce costs that are based on strategic decisions. These decisions are often made from statistical data collected from specific sources throughout this quality improvement process. Taught to use special tools, these individuals are able to use data taken from all aspects of the finance industry and figure ways to change an organization’s day to day practices for the better. Financial institutions aim for the highest revenue they can possibly attain, but without proper training of staff, this cannot be achieved. Six Sigma is effective at training staff members in helping eliminate the company’s excess spending, errors, and issues that may arise during certain procedures or processes. It is also not uncommon for some staff members to become unproductive which will cost the business money over time. The Six Sigma program is able to effectively train staff members in order to help reduce cost and increase revenue. Financial intuitions operate under the goal of improving their relationships with their customers. Six Sigma is able to boost this goal with its beneficial project management methods and training courses. This is especially helpful within the finance industry. The Six Sigma process will also help individuals figure out better and more efficient ways of understanding customer needs and allow them to quickly provide effective solutions. With the help of this methodology, the finance industry will receive higher satisfaction feedback through experiences with their consumers. This leads to customer retention and will also help to grow the customer base. A trained Six Sigma team will be able to determine the main reason(s) behind the lack of performance within the organization. The finance team will also be able to find the key performance indicators, or KPIs, that are needed to improve the business. Within the finance industry, there are several defects which slow down business overall. Six Sigma training is able to pinpoint these defects and reduce the chances of them occurring. The fewer the defects, the faster the business will improve. Human error is a problem which occurs in many businesses and industries. However, the Six Sigma methodology is able to bring about new methods and mind-sets which cut down the amount of errors. A Six Sigma trained finance team can be involved in keeping the company’s project pipeline full. At the beginning of these projects, a trained team will evaluate the purpose of the project and what it stands to correct or amend. The team can also aid in prioritizing and selecting projects, as they will have a greater understanding of which decision will be best for the company financially and what will make the company most successful. Overall, the team is able to locate those projects which will prove most beneficial to the company’s goals and financial objectives. This is especially important as the industry needs to continuously effect change in order to keep up with the ever developing and changing market. When you are capable of making a significant impact across your organization as well as being viewed as an indispensable asset to your organization, it goes without saying that leadership opportunities will become extremely common. In fact, the more you advance your Six Sigma skill set, the more opportunities will present themselves. An Accredited Six Sigma Certification is a valuable asset in today’s job market. A Six Sigma Certified professional is in high demand and is highly respected. With more organizations adopting Six Sigma methodology to improve performance and reduce defects, certification can open career opportunities for positions all over the world. Our certifications have attracted the largest and most respected names in Finance including Fannie Mae, JP Morgan Chase, Wells Fargo, Prudential and Citigroup … just to name a few. Note: Just as any educational achievement, your career prospects of being Six Sigma Certified is extremely dependent on several factors. Location, previous experience, industry type, etc. all will play an enormous role. We offer several different Six Sigma Certification and Lean Six Sigma Certification in Finance courses for your online Six Sigma training needs. Our courses include White Belt, Yellow Belt, Green Belt, Black Belt, and Master Black Belt Certification in Finance programs. Our accredited training and certification programs in Finance provide for customized learning at every level to allow each individual a role in improving their organization’s processes. This multi-level approach fosters team unity and leads to each employee feeling more valued by the company. Six Sigma White Belt training is an ideal beginner level for those simply looking to understand the basics of Six Sigma. It works best for employees who are unfamiliar with Six Sigma and want to learn more about the methodology and how it can impact an organization. For a limited time, we are providing free White Belt training and allowing the public to obtain an official Six Sigma White Belt Certification at no cost. As this service is being provided at no cost, please understand that we do not provide instructor or technical support for the Six Sigma White Belt training and certification. This “Six Sigma” Certification is also available in a “Lean Six Sigma” version. Our Yellow Belt course teaches the relationships between improving quality processes and an organization’s profitability. A certified Six Sigma Yellow Belt has received introductory training in the fundamentals of Six Sigma. In this training and certification program, you will be trained to identify, monitor and control profit-eating practices within your own processes. You will also be prepared to feed such information to the Black Belts and Green Belts working on larger scale projects. This “Six Sigma” Certification is also available in a “Lean Six Sigma” version. This course trains and certifies the employees that will directly participate in Six Sigma projects. Our training develops enhanced problem-solving skills and teaches you to apply statistical methods for process improvement. Green Belt training is ideal for anyone looking to get the most out of their career. Improving the quality of processes and experiences has long been effective within all industries and environments. Employees trained in Six Sigma effectively improve customer satisfaction and consistently increase profitability. Much of a Green Belt Certified individuals responsibilities are to manage small scale project while also supporting Black Belts in larger endeavors. This “Six Sigma” Certification is also available in a “Lean Six Sigma” version. This course trains and certifies those who will lead Six Sigma efforts within the organization. A Six Sigma Black Belt Certification will drastically improve your employment opportunities. 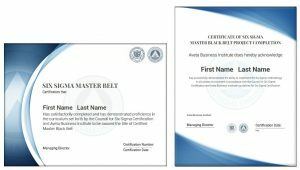 It not only certifies your knowledge of Six Sigma, but also your qualifications to lead efforts within the organization. A certified Black Belt exhibits leadership qualities, understands team dynamics, and assigns all team members with roles and responsibilities. In this role, Black Belts also coach, develop, and advise the management and the employees to achieve common goals. This “Six Sigma” Certification is also available in a “Lean Six Sigma” version. This is an advanced level program that requires successful completion of our Black Belt Certification Program and several project requirements. For those seeking this achievement, please refer to the bottom of our Black Belt Certification page. This “Six Sigma” Certification is also available in a “Lean Six Sigma” version. Prepare for a full time organizational role leading Six Sigma Projects by coaching, and training a Six Sigma Team with a Six Sigma Black Belt Certification. A Six Sigma Black Belt has the necessary skills to move projects forward and optimize team efficiency, working with both management and project team members to execute success. a large selection of supplemental material, including numerous downloadable tools and templates that can support you throughout your professional career. Our courses are an independent, textbook-based structure. Generally speaking, you will read the required sections and are tested for proficiency. Additionally, there are some Supplemental Materials available within our courses (consisting of various videos, PDFs, MS Word & Excel templates, PowerPoint presentations, and more). These materials are not required reading for the exams, however they do promote a more thorough learning experience. The exams are multiple choice (approx. 10-15 questions), are delivered online, can be saved and resumed, can be retaken as many times as needed, and scores are immediately posted. The exams are available to be taken online 24 hours a day, 7 days a week. They are both open-book and non-timed. Rest assured there are no “hidden” or “extra” fees in our programs. The enrollment fee covers all testing and your certification. There are no prerequisites for our standard Lean Six Sigma Black Belt Certification Program. However, this certification is a prerequisite for any individual wishing to continue on to our Level II Black Belt Certification, which does have a required project component. Individuals must successfully complete each of the 33 self-paced Certification Exams with a minimum minimum score of 70% on each individual exam. Each exam is approximately 10-15 questions. Once payment is arranged, you will have 1 year to successfully complete the requirements. Course extensions are available before the deadline upon request from Customer Care (free of charge). Once payment is arranged, you will have 1 year to successfully pass the exam. Course extensions are available before the deadline and upon request from Customer Care (free of charge). Six Sigma Black Belts primarily focus on project execution, whereas Champions and Master Black Belts focus on identifying projects and functions for Six Sigma across an entire organization. Our Black Belt training provides certification candidates with the tools they need to earn their Six Sigma Black Belt certification, which is very important in helping them take on the role of project supervisor over the Six Sigma program in their company. 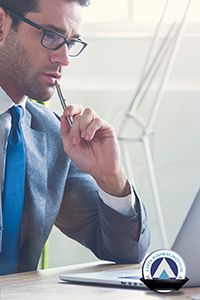 Six Sigma Black Belt training teaches candidates how to oversee Six Sigma projects, allowing them to be directly responsible for increasing profitability within their organization. Most often Black Belts will hold this position for a few years in a full time capacity and then will return to their regular job duties. They help coach, develop, lead and advise both management and employees to achieve their goals. They are expected to take on projects with organization-wide savings estimated at least $100,000 – $250,000 or more. Whether implementing Six Sigma in healthcare, finance, manufacturing, government, or any other service or product based industry… Six Sigma Black Belt Training is ideal for anyone looking to get the most out of their career. Enroll now in the Black Belt Course to obtain our industry-low pricing. The Black Belt course includes the following certifications: White Belt, Yellow Belt, Green Belt and Black Belt. The enrollment fee covers all testing and your certification. – Successful passing of multiple open-book exams with 70% minimum score. We offer various levels of Black Belt Certification. The further you advance, the more you can expect to see a drastic change in your earning potential as you further set yourself apart from the competition. Employers will depend on your ability to vastly improve both quality and profitably levels. Note: This is an Advanced Level Certification. A Standard Black Belt Certification is a prerequisite for applying for this Certification. Note: This is an Advanced Level Certification. 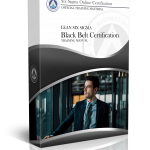 A Black Belt Certification Level II is a prerequisite for applying for this Certification. Note: This is an Advanced Level Certification. A Black Belt Certification Level III is a prerequisite for applying for this Certification. – Completion of all prior exams with minimum scores of 90%. As one of the most established and longest running providers in the industry for online Six Sigma Training & Certification, we have had millions of people just like you weighing our training against the competition. Here are just a few reasons why many prospective training candidates who have performed their due-diligence have chosen to trust us with their educational needs. Not only is our organization accredited by The Council for Six Sigma Certification (the largest industry accreditation provider to colleges, universities, and private training organizations worldwide), but we also share some of the same original founders. This speaks volumes to our heritage and our underlying commitment to quality education and consumer value. Many providers come and go, but we have remained a trusted industry pioneer. Six Sigma Online was among the very first to offer online-based Six Sigma training and certification. Over 130,000 certified graduates from the Americas to Asia to the Middle East have trusted our accredited programs to enhance their careers. Our clients range from multi-national corporations like Coca-Cola and BP to Government Organizations like the US Department of Defense. Find out why we are the trusted choice today! Unlike many Six Sigma Certification providers, we never put an expiration date on your certification. Many providers require renewals not so much to benefit their certified students, but instead to increase their own revenues. This can be extremely lucrative for them as they force you to pay extra exorbitant costs over the course of your entire career. Even worse, these costs are often hidden the details of the expiration in fine print. It is not uncommon for a student to be shocked with this information only AFTER they have earned their achievement and see their final certificate. Think about it… does a college degree come with an expiration date? Neither should your Six Sigma Certification. Rest assured that our training is well recognized in the business community and we take the needs of employers very seriously. Many other training providers certify their students without a serious attempt of teaching thorough and lasting fundamentals of Six Sigma business methodologies. Our programs were designed to offer the most flexibility while still retaining a rigorous course-load. Every Six Sigma course offered by the Aveta Business Institute is self-paced. Your life can become unexpectedly busy and stressful… we aren’t looking to make things even worse by imposing unrealistic deadlines. Since our courses are designed for individuals whose schedule demands a self-paced approach, you decide when to take your exams. There is no “set” scheduled online class time (or date). Our courses were designed to fit around your busy lifestyle. Our students have 12 months from the time of payment to complete all of their certification requirements. But again, our students are never pressured to finish their program. Even if you require more than 1 year to complete your program, course extensions are always available before the deadline upon request from Customer Care (free of charge). We Pass Our Savings Onto You! We offer the same quality Six Sigma training you will find at many top universities. However, many of these leading collegiate training providers have a problem. They offer both classroom-based and online-based programs. Classroom-based training is much more expensive for these providers since they have to pay for facilities, full-time instructors, travel costs, etc. When asked to justify the higher price, their only real justification is that since an instructor speaks to an entire class, you would have learned significantly more than if you would have read the same material yourself (even though U.S. Department of Defense studies have shown that online training proved to be more effective in courses of greater complexity than classroom-based instructor-led training). Let us not also forget that in a classroom environment, students are rushed through their programs (and often not given a chance to absorb the material) due to strict time constraints. Most importantly, students are not provided a way to easily reference the material later (it is only natural that students will forget pieces of what they have learned as time goes on). This reasoning makes learning Six Sigma in an online environment HIGHLY preferable to classroom-based training. In a perfect world, this shouldn’t matter since many respected colleges and universities also offer online courses. Often, these colleges and universities keep their online prices inflated to help subsidize their classroom-based programs. This is why you will see our same program sold for double or triple the price elsewhere. We would much rather keep our prices honest and pass the savings directly to you. "I will convey the positive experience I have had with Aveta to my Microsoft colleagues who are also interested in GB/BB certification. I especially appreciate the customer care response times (online support and/or within 24 hours email support), and the thoughtful note regarding the project review." "I want to thank you, as a MBB Certified Instructor and President and CEO of Six Sigma Online, for the tremendous Six Sigma Programs that your company offer. The price is right, the text and exams excellent and the application of Six Sigma principles and techniques to practical business problems (projects) gives the student the necessary understanding and experience to tackle such problems in practice in business. I cannot thank you enough for the existence and quality of the offerings through Six Sigma Online. Your Customer Care Center is excellent, always courteous and helpful." "I found Aveta to be a very informative and efficient way to study Six Sigma and look forward to recommending Aveta to colleagues in the future." "I am impressed by your services and will enroll in other courses in the future. Without reservation, I encourage my friends and co-workers to take advantage of Six Sigma Online." 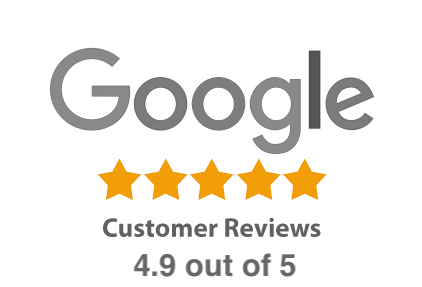 "I would like to thank you for providing me with an excellent service over my whole black belt experience and I feel the internet learning was brilliant and I would not have achieved this certification without this opportunity. "